[Joala] says he’s able to scale this up to paint scenes at least triple this size, but also has his sights set on shattering the record or the world’s largest mural. Shades of “The Phantom” from Unamerican Graffiti, 2000AD Prog 206-207. 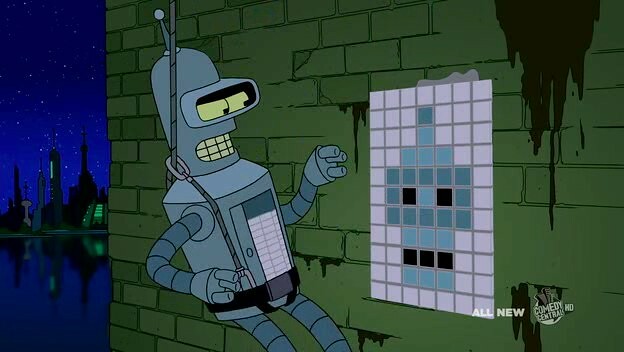 Bender can already do this. Much faster as well. People were using automated graffiti spray wands. Hold it over a surface, wave it back and forth while a row of nozzles along it spray the image. I don’t get it, why would it not be art, what defines art. Personally I even consider every design as a form of art. So some normal household objects are effectively a piece of art, but for some reason we just neglect these things and do not refer to them as art. For some reason art must be exclusive… and then sometimes not… This painting robot is exclusive, the tower is exclusive the image is not seen in this configuration on other places (I guess) so my asnwer would be , yes this is art. I’ve always wondered how music can be beautiful when, Beauty is in the eye of the beholder. Without a direct visualisation of sound music is never beautiful. This mural is beautiful work of art creatively created. Graffiti is not art, it’s vandalism. Graffiti “artists” are not artists, they’re thugs.